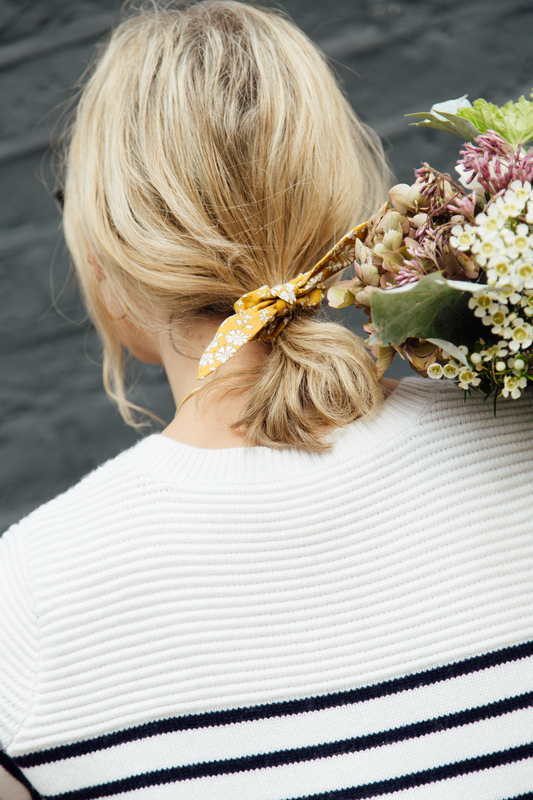 Ever wondered what it would be like to wander around town in your comfiest ‘around the house’ clothes? 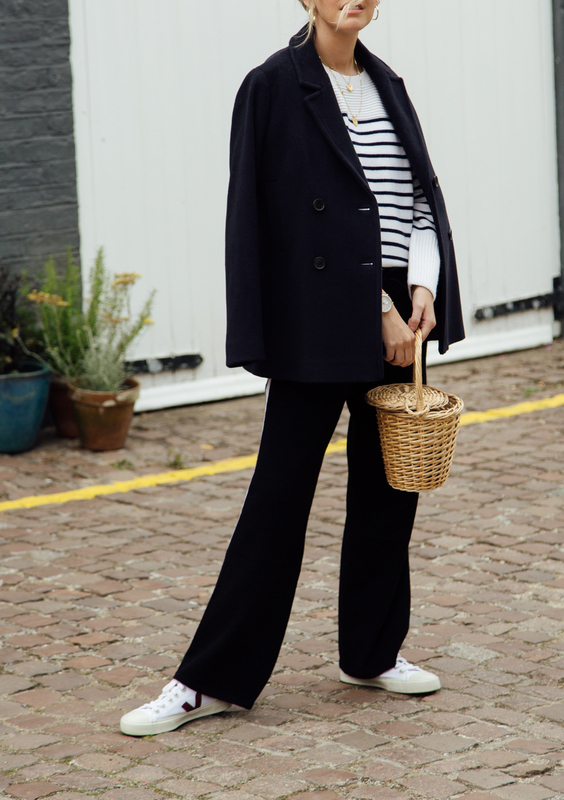 Well, you no longer have to as inside clothes have transitioned to the ultimate outside outfit – and it’s now forming a key part of my capsule wardrobe. I have stopped doing Fashion Weeks as much as I used to, mainly because I have realised that I don’t really follow that sort of style…I love an occasional trend but in all honesty, I like what I like. Stripes? Of course. A pea coat? Definitely. Both essential aspects of what I would consider the perfect staple closet, they look wonderful together but equally, individually, they can work with almost anything. I’m a huge advocate for using stripes to dress down sequins, as much as dressing up jeans and a pea coat is one of those pieces which just doesn’t date. 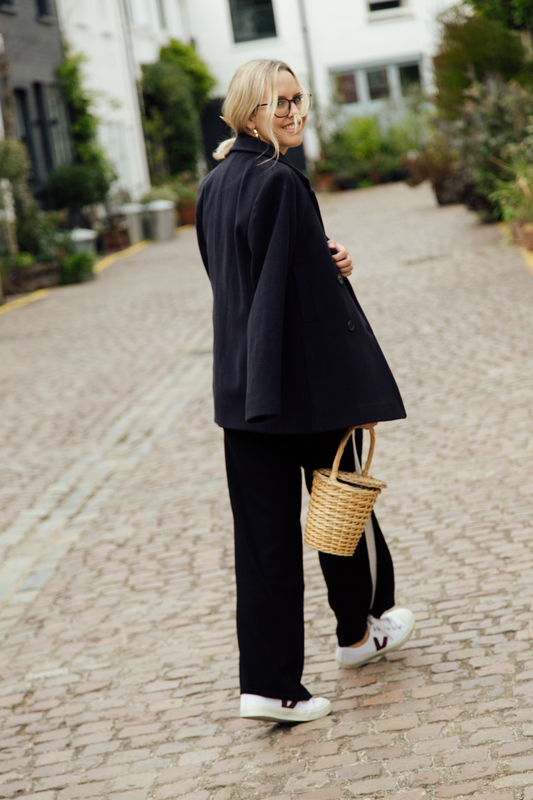 Obviously, I am a self confessed lifelong member of the lounge pant brigade and if there is anything I would invest in over a designer handbag, it’s comfort clothes. 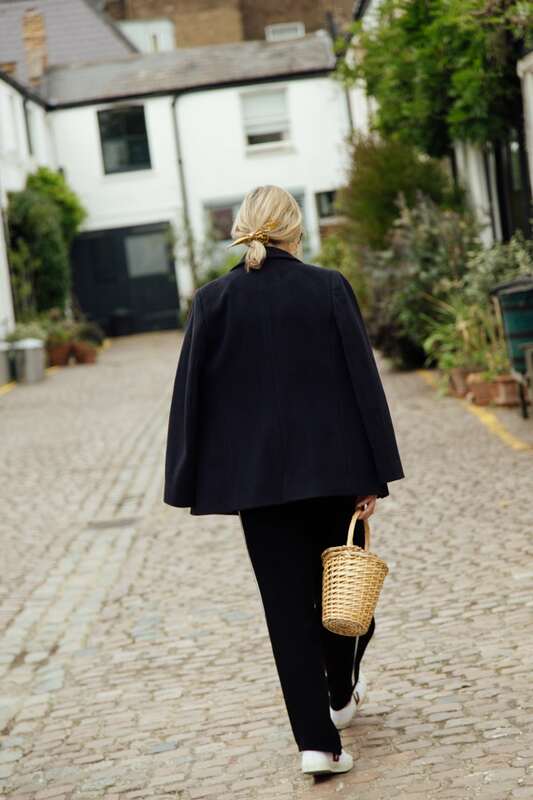 Especially over those first few post partum months, I swear it was my cashmere and merino wool pant collection pretty much holding me together by the seams. 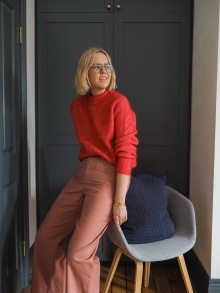 These trousers have, however, gone one step further and even, dare I say, fall into fashion category – I loved wearing them with a stripe knit in what was essentially a track suit look (!) but with a far more elegant twist. Jumper: £129, The White Company. In today’s fashion world, with everyone wearing the latest trends: dad sneakers/cycling shorts/cowboy boots I’d like to say it’s okay to like what you like and dress for ease, comfort and confidence. I’m so much more confident in my own skin and personal style now I’ve reached my mid thirties and I wouldn’t change this for anything. Coat: £198, The White Company. Cashmere jogging bottoms: £169, The White Company. Jumper: £129, The White Company. 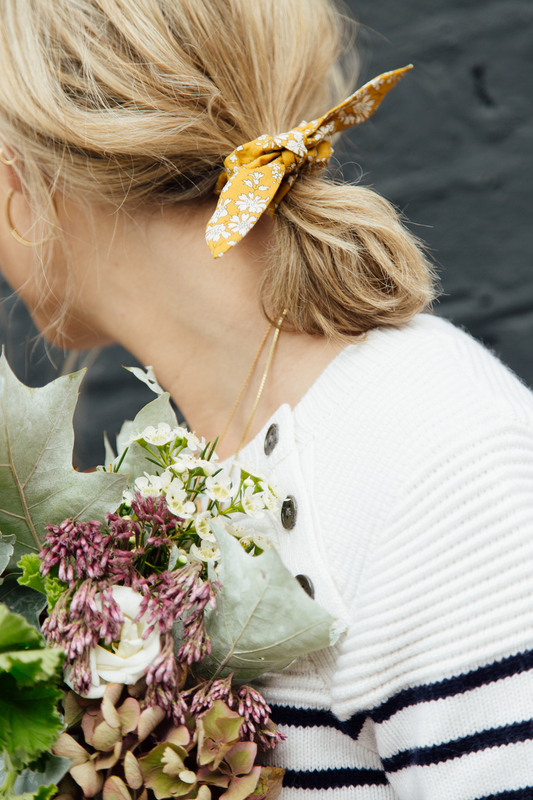 This post was in partnership with The White Company, all Art direction and imagery my own. May I ask where the scrunchie is from? Can you tell me more about cashmere pant maintenance with a newborn? I love the idea of this but I just get soo gross with children (TMI). I’m about to have my third baby and would love to treat myself to them but not sure the cost of dry cleaning is worth it? Dont know about the cashmere pants Alex has, but my cashmere sweaters go in the machine on a cold wool wash with the slowest spin cycle. All of my cashmere is marked hand wash, but the machine is safer as I tend to have the water too hot if I hand wash (OH can attest to shrunken knits). Ohhh that’s good info. Will try it with an old cashmere sweater and see how I get on. Thank you! Love the jumper. I’m just about to have my second so may have to invest in those jogging bottoms. p.s. If this is the mews with the pink & orange houses at one end then you were right outside my office!! To dress every day in White Company comfort would make me very happy! Even though you’re not doing much of the fashion weeks, I have to say I have loved your posts in the past about adding new season trends to your wardrobe, and really hope this is something you still intend to do. Just gorgeous Alex! 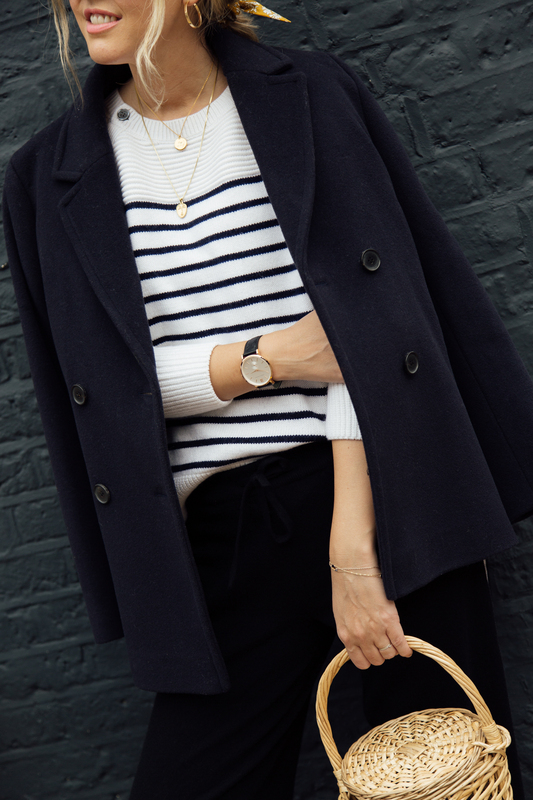 And yes, I am definitely here for liking what you like (which in my book is also stripes, cashmere, and classic pieces I’ll know I’ll love for years to come – even if that doesn’t make me one of the ‘cool’ girls). I think I need to have a look online at the white company. Very impressed with your outfit. However, it is rare they stock items suitable for a larger and more mature person. Would you mind telling me where your basket is from? Many thanks ?? Love this outfit on you! 🙂 Would you say the pants come up big or small? Im normally a Boden 10-12 in pants. Really refreshing to see & hear about just buying what you like, rather than having shouty bloggers ramming it down your throat about the latest trend/item must have and getting SO over excited about it!! There’s something very Lauren Hutton about how you’ve styled this. Love it!